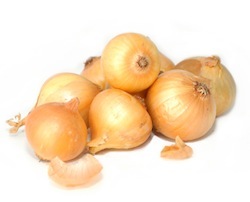 Onions are packed with sulfur-containing containing compounds, which are responsible for their pungent odor and associated with improved health. Onion (Allium cepa L.) and garlic (Allium sativum L.), among the oldest cultivated plants, are used both as a food and for medicinal applications. disturbances of the gastrointestinal tract (e.g. colic pain, flatulent colic and dyspepsia). These widely-used and versatile vegetables are believed to inhibit inflammation and linked to everything from cholesterol reduction to cancer prevention. Try using onions as a base for soups, sauces, and stir-fries. Other foods with the same benefits include garlic, leeks, and chives.